With words as polished as his looks, Igee gave us a passionate interview in which he reveals exactly what his job entails, his influences and dishes out a priceless one-line advice for aspiring bloggers. This interview is severely rich in content and quite enlightening. You’ll enjoy it. Hi Igee, tell us a bit about yourself and your love for fashion. I adapted the internet and social media into my daily life at a very early age; at a time where I was learning who I was, and who I wanted to become. Dressing well became an interest I had, and I sort of started to figure it out on my own with what I was seeing in music videos, and magazines. Soon after, I discovered showing off personal style was a thing on the internet. I have lookbook.nu to thank, because the platform exposed me to a variety of styles, and inspired me to want to share my take on what menswear is to me. I started to post photos, and soon enough, I realized that the characters/influencers on the Lookbook platform were getting their own websites, and sharing their point of view as it pertained to their way of life. It was exciting. I got to know more about certain people through their aesthetic, and the things they would write about that was not exactly relevant to what lookbook was offering. That was great! Until I started to realize I could not relate, and identify with most people who were doing it at the time. This prompted me to want to start my own blog. To create variety, and diversity in an industry I had an interest in. I am just one voice in a conversation. Can you tell us more about what you do? Yes, of course. Modeling is part of my job, creating, directing the shoots is a part of my job, organizing editorial calenders is a part of my job, creating innovative content, and being an editor is also part of my job. It’s marketing, it is advertising, it is journalism. My content thrives mostly on expressing my personal style, and teaching people how to incorporate those pieces into their everyday lives. This requires me to write articles, and indulge in photo shoots to show off the clothing. I had someone comment on my instagram once, they called me a “walking style guide.” That’s pretty much what www.igeeokafor.com is. 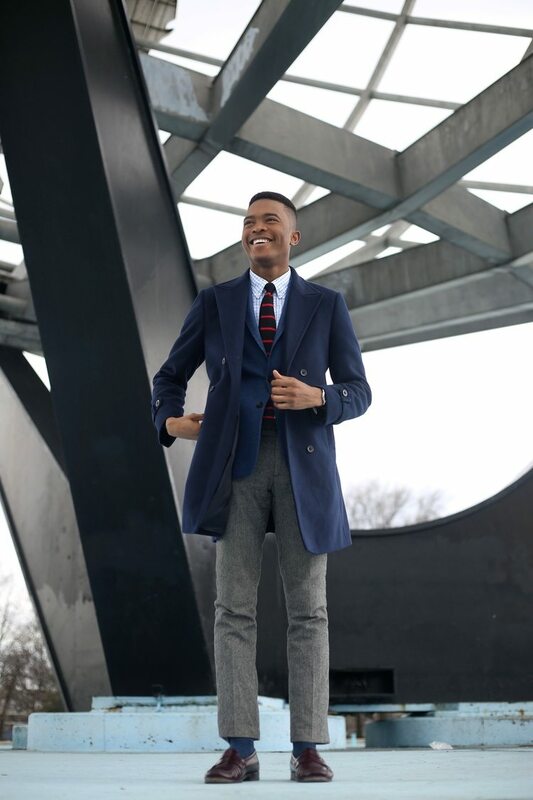 It is there to create conversation, and help guys who have an interest in menswear – guys who may, or may not have figured out what to identify themselves with, or how to identify themselves given the platform. Occasionally, I partner with brands I connect with to increase the quality, range, and credibility of my website content. I now also do book, and restaurant reviews. I also hold monthly interviews with other menswear influencers that have inspiring stories that people can learn from. You’re one busy guy and you seem to do it all so well. Clean, sharp, minimalistic, and traditional with a dash of contemporary movements in menswear. Who’s your biggest inspiration fashion-wise? You’re based in New York, which is arguably the fashion capital of the world. As a fashion insider, can you tell us what you think will be the big hits in men’s fashion this summer. Oh yes! Fashion loves New York, as much as New York loves fashion. Here, you’re exposed to a variety in culture, and I am so lucky, and blessed to be able to experience such range in creative/personal expression. This way, I am able to learn a lot, and stay cultured. – Big hits in men’s fashion this summer? I’m going to go with what I am looking forward to for myself, and it’s colorful suits, all whites, and Seersucker. A variety of places. It depends on the product, and the price; I try to go for the best deals on the best quality. I’m a customer at Brooks Brothers, J Crew, Club Monaco, Ben Sherman, Nordstrom, Lands End, Tommy Hilfiger, Jay Butler, and Jack Erwin to name a few. Is there anything you often spurge on? I try to stay as minimal as I can. The people I have gotten to a chance to connect with, on a professional and personal level. There are many challenges. When I do interviews, I tend to talk about the same challenges that deal with the actual amount of work, and process it takes to put out content. One challenge I have never publicly referenced, is the fact that most people misunderstand what bloggers do; For example, I was on a panel full of very experienced people who work in fashion. Once I arrived to meet everyone before the event, one of my fellow panelists goes, “Oh, so you’re a blogger. How does that work with people following you around, taking photos of you?” The perception of what it is from things people see from the outside contributes to that, and that’s out of our hands. Not being able to defend, and enlighten people about what it really is, is a challenge. What do you do when you’re not busy blogging? I enjoy watching documentaries, movies, and tv shows. I love music. I’m always listening to new music. I read new books, usually autobiographies. I go out dancing with friends, and I attend events to meet new people. I do a series of things, I am always up for a good time. What’s the biggest tip you have for anyone wanting to start a fashion blog? Have a point of view, and share it in every dimensional way possible. So where do you see your blog in the next five years? I see my blog turning into a bigger personal style, lifestyle, and learning reference for diverse groups of men all over the world, with the help of more social content, writers, and brand partnerships. …And where do you see yourself in 5 years? In 5 years, I’ll be 27, and I assume the question is based on professional endeavors so, by then, I want to have secured tangible, and financially rewarding work experiences, that’ll aid to the enabling of my own menswear/lifestyle brand. Igee, it’s been really wonderful chatting with you and learning more about the art of fashion blogging. We wish you much luck as you continue to grow your personal brand. Yessss, Igee! Get. It. Boy! Photos: Scarlett Johansson’s May 2016 Cosmopolitan Cover is Downright Gorgeous!